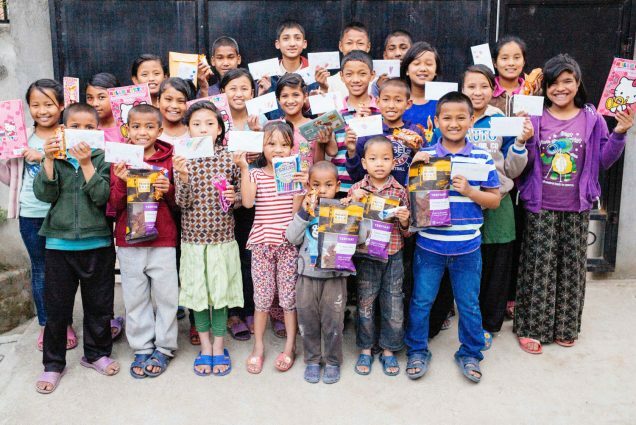 Their first stop was to the Peace Gospel International Nepal Boys Home and Girls Home where the children devoured their first ration of peanut butter & chocolate protein bars, and enjoyed reading letters which contained notes and drawings from the Kindergarten class of Horn Elementary in Houston, Texas. They then were able to set up the water purification gear they had brought with them, which will provide 2 liters of clean water per day for each person in our programs for 78 days! Their next stop was to the She Has Hope trafficking rehabilitation home where they delivered food rations and special gifts such as skin care products and lip balm to the girls. One of the girls said, “Look at all the good things the earthquake has brought us!” The girls were so happy that they broke out into singing and clapping, sharing 5 or 6 Nepali songs with Kirby and Cody. However, of the 13 girls currently living at our She Has Hope rehabilitation home, 7 of them have parents whose homes were completely destroyed in the earthquake, and many have relatives who perished. They are very sad and shocked on top of the trauma they are already dealing with. 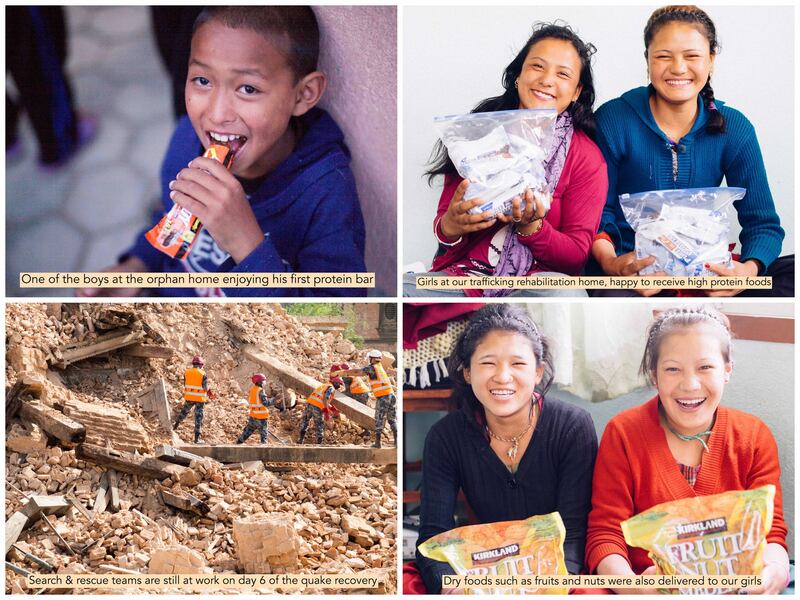 If our Nepal Earthquake Relief Fund (link) continues to grow, we hope that we can bless them with new homes to return to after graduation from our program — a typical stone and mud village house costs only about $2,000 to construct. Please pray to see if you could contribute a few stones, a wall, a door, or a roof of one these homes. Today Kirby, our native director Bimal, and Cody hiked to reach the village of the Peace Gospel International farmland, very close to the epicenter of the earthquake, to deliver much-needed food and medicine to our staff and our farmland’s neighbors. Many of the roads have been cut off, so they drove as far as they could and backpacked in the remainder of the distance with the supplies. It was a very eye-opening day; they reported that most of the homes in the villages along the way were completely destroyed in a war-zone-like setting. Our native director Bimal reports that the death toll from the earthquake will certainly be climbing — he has heard from local reports that over 1,600 people died just in the tiny mountain district of Sindhupalchok alone. Many of our She Has Hope graduates are from this district and many cannot be reached. Please keep the girls and their relatives in your prayers, along with our orphans and our native staff. If you have not already donated to our earthquake relief fund, please chip in any amount using the “take action” link below — it will all make a lasting difference in bringing hope. Thank you so much for following our stories and posts here on our web site, and on Facebook, Twitter, and Instagram, and not growing numb to the news. It is important to stay aware of the needs and the reality so that we can generate the monumental support that Nepal is going to need in order to recover from this devastating catastrophe.